How can plants be grown without soil? Where does chocolate milk come from? Why do chickens lay different colored-eggs? 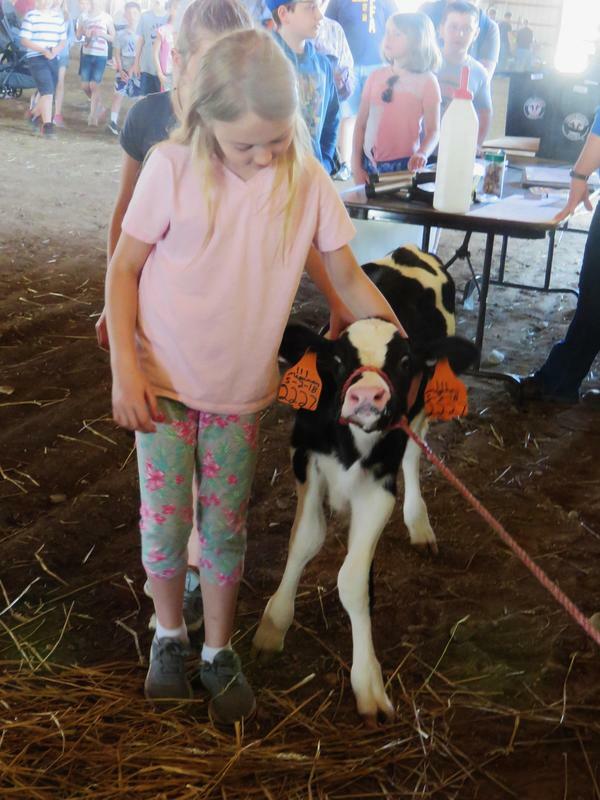 Thornapple Kellogg third graders asked and got answers to these questions and many more at the 14th annual Barry County Ag Awareness Day at the Barry County Expo Center. 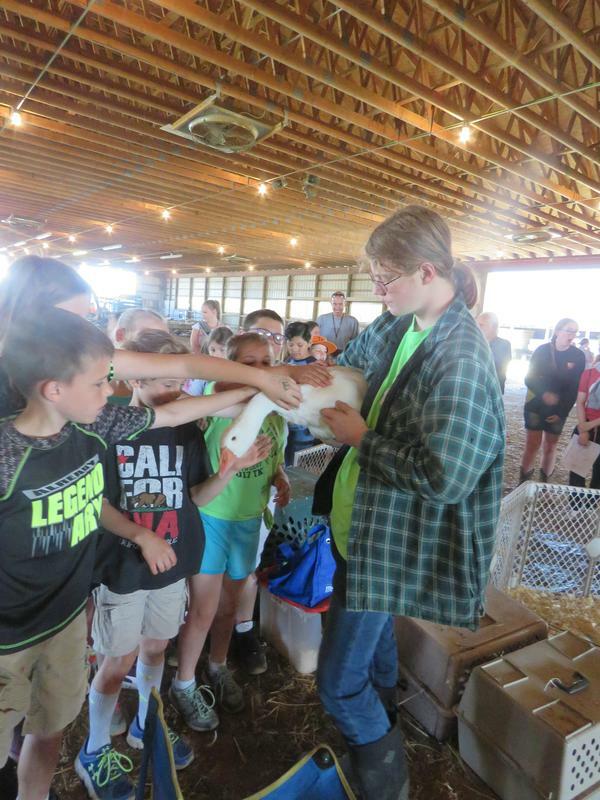 More than 500 students from Hastings, Delton Kellogg, Thornapple Kellogg and Barry County Christian schools visited different stations set up at the fairgrounds to learn about agriculture and its importance to Barry County and the state. 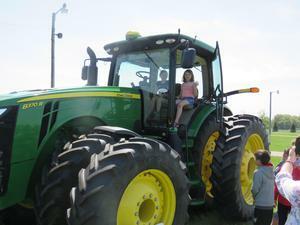 Tyler Wenger’s station with a giant John Deere tractor from GreenMark Equipment, was a favorite among the kids. They learned how farming has changed greatly over the years with much larger and more sophisticated equipment. He demonstrated how the tractor could follow a preset path without the driver ever having to touch the steering wheel and how planters are programmed to drop just the right amount of seeds in the soil. Third graders eagerly waited for a chance to sit high up inside the tractor cab and get a real feel for what a farmer sees when driving. Not far away, children were petting pigs, rabbits, chickens, sheep and cows. They watched sheep shearing and learned about the foods livestock animals eat and how farmers grow the food. 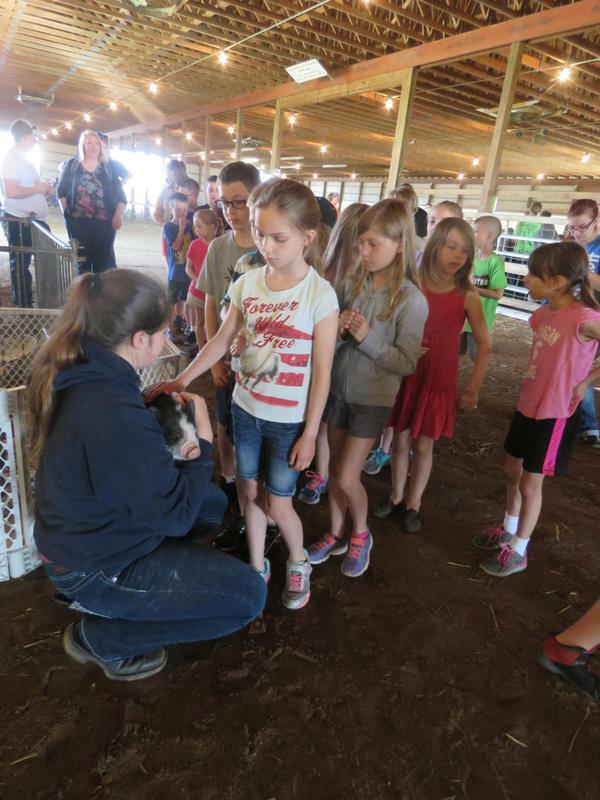 Barry County 4-H members and local FFA students led many of the 22 different learning stations. Some brought they will be showing at the fair, inviting them to go to the fair in July and see how the animals have grown in a short amount of time. They also talked about some of the little-known facts about the different species and how the teens care for their animals. Everett Dingman said he answered a lot of questions and showed the younger students what he has to do for 4-H.
“One of the questions they asked was when the meat from the cows gets to the packages,” he said. Rachelle Lehman of Barry County Farm Bureau said Ag Awareness Day is a chance to expose children to agriculture. Less than 2 percent of the United States population is involved in agriculture, and many youngsters, although living in a rural community, have never been around farm machinery or livestock. Paul Shetterly of Shetterly Sheep Farm in Lake Odessa, spent his day at the ag awareness event shearing sheep. He told students that shearing the wool off doesn't hurt the sheep at all and actually makes them feel better. Students had a chance to explore everything from hydroponics to aquaculture, horses, dogs, beekeeping, soils and more. The annual event is sponsored cooperatively by the Barry County Farm Bureau, MSU Extension, Hastings FFA and Barry Expo Center.